The backyard dog is fast becoming a thing of the past. Decades ago, it was common for dogs to live their entire lives outside in suburban and urban yards. But as our knowledge of canines has evolved, we've learned that staying outside 24/7 can be hazardous for a dog's health. The list of potential dangers is long and varied: poisonous plants, puddles of toxic antifreeze, sharp gardening tools, deadly pesticides, cruel teenagers and revengeful neighbors -- just to name a few. Even when confined to a fenced-in yard, dogs aren't safe from other wildlife that can still easily enter. Think yellow jackets, poisonous snakes and hungry coyotes. But perhaps the biggest danger of all is the weather. Dogs can freeze to death or suffer from heat stoke just like people can, says veterinarian Dean Vicksman of Evans East Animal Hospital in Denver, Colo.
What are the health risks for dogs outdoors? 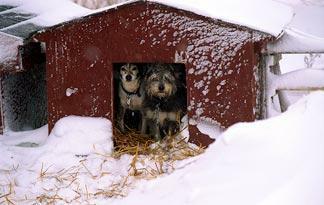 Any dog will suffer if left outside in extremely low temperatures, but shorthaired breeds like Labrador retrievers, Weimaraners, beagles and greyhounds, as well as young, old or ill dogs are most susceptible to hypothermia, a potentially deadly condition where body temperature falls below normal. Signs include shivering, lethargy and lack of coordination. As the condition progresses, dogs may become comatose and die. Warmer climates present other challenges for canines, especially for short-nosed (brachycephalic) breeds like shih tzus, bulldogs, boxers and pugs. These, along with other brachycephalic breeds, are more susceptible to heat stroke because of their inability to effectively rid their bodies of excess heat by panting. Geriatric pets are vulnerable to overheating as well. 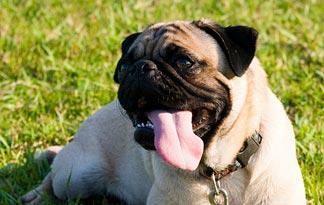 Signs of heat stroke include excessive panting, drooling and gums turning deep red. If left untreated, overheated pets may perish. Generally speaking, most experts agree that, for many reasons, it's always best to keep your dog indoors -- and it's never best to leave him or her outdoors unattended for extended periods of time. But it's particularly important to keep your dog inside when temperatures hit highs and lows. Vicksman recommends bringing puppies, kittens and short-haired dogs inside when the temperature falls below 40 degrees Fahrenheit (4.4 degrees Celsius). Larger, furrier breeds that are acclimated to living outside in cold conditions can handle colder temps a bit better than short-haired breeds, but they still should never be left outside when the thermostat hits zero degrees Fahrenheit (minus 17.7 degrees Celsius) or below. Most healthy dogs can tolerate the heat as long as they have shade, Vicksman told Animal Planet. But the San Diego Humane Society points out that long-haired breeds like huskies and chows are more sensitive to heat. And as anyone who lives in the humidity-soaked Southeastern United States and the sand states in the West can verify, summers are unbearably hot, and deaths occur in both people and pets who don't have access to air conditioning. Also, there are individual sensitivities, so some dogs -- regardless of breed heritage -- are more affected by the heat and cold than others. If you must leave your dog outside for extended periods of time, take additional steps to protect his or her wellbeing. In warm or tropical climates, dogs need an area that remains shady throughout the day, even as the sun shifts positions in the sky, along with a fresh supply of drinking water, according to Vicksman. To prevent lightweight bowls from being tipped over, dig a hole in the ground and place a bucket in it. Then fill the bucket with equal parts ice and water. As the ice melts, it will provide cool drinking water over the course of the day. A raised outdoor bed is also a must to keep dogs off smoldering surfaces, like concrete and landscaping rocks, and safe from the insect-infested ground. During the winter months, protect your pet from getting blasted by wind or soaked from snow -- both of which draw heat away from the body. An insulated doghouse with a waterproof roof and weather-resistant door flap provides needed shelter from harsh outside elements, advises the University of Illinois College of Veterinary Medicine. Consider purchasing a doghouse heater (some models cool during the summer, too) or placing a heated bed or pad inside to make it extra comfy. "Additionally, we must remember that bigger is not always better," says Vicksman. "A house that is just big enough for the dog will warm him up faster and retain heat better than a house that is too big." 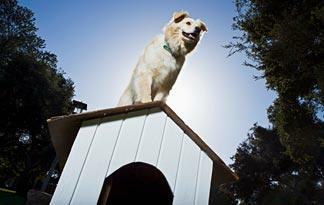 Structures should be large enough for dogs to comfortably stand-up and turn around. For multi-dog families, each pet needs his or her own house. 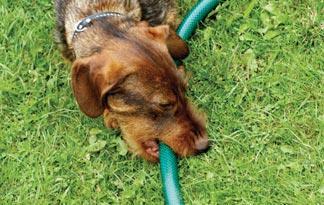 Finally, dogs also need access to drinkable water during the winter. "I recommend heated water bowls," Vicksman said, "and that owners replenish them often."